This is my first time joining in for Theme Thursday! The kids are all asleep and I was relaxing in front of our beautiful tree after a long day and figured I would snap this picture of one of our favorite ornaments. I bought it for John when we were dating as a gesture to show that I was OK with his Catholicism and that I appreciated many of the traditions and understandings of faith that he brings to our relationship. Check out more great pictures @ Clan Donaldson! I love the light flare over Mary's shoulder. Lovely. Thanks everyone! 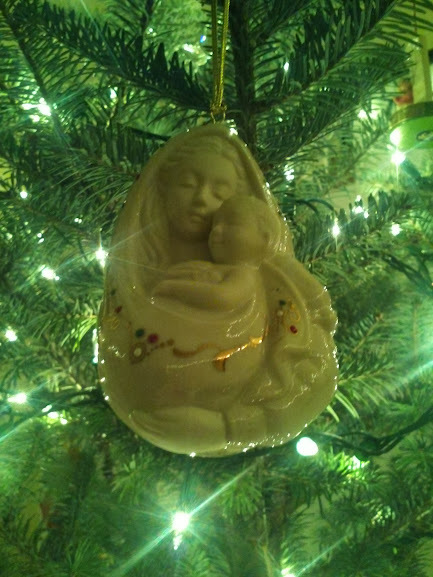 John tells me it is still his favorite ornaments and one of the best gifts I have given him!